Graduates of the University of Illinois' campuses stand out each year as professionals who have helped their organizations earn recognition through the Illinois Sustainability Awards. Eric Shutes ('99) displays one of the green initiatives at the Naperville Park District. Park Police hand out cards to visitors explaining why they should never feed ducks and other wildlife. As a U of I student of landscape architecture (’99) Eric Shutes was impressed by the impact of natural space on the health and happiness of people. It was as part of the University’s East St. Louis Action Research Project, helping the city sustain a farmers market, that the linkage between fresh, natural food and community’s quality of life became vivid to him. Shutes cited research from a U of I professor, William Sullivan, which helped establish scientifically the benefits natural spaces have on human health, performance, and happiness. He was reminded of the connection earlier this year when Sullivan presented his newest findings at the Morton Arboretum. After 16 years at the Naperville Park District (NPD), Shutes has played his role in maximizing those benefits for urban populations, leading to the District winning the Illinois Sustainability Award for the second time. The District first won the Illinois Sustainability Award in 2012. Shutes acknowledged that a lot has changed in the Chicago area’s embrace of sustainable practices since he joined the Naperville Park District in 2001. Several years of planning and construction of NPD’s South Maintenance Facility, completed in 2007, is a case in point. Naperville’s first LEED certified building (silver) drew a lot of scrutiny from finance quarters asking why an extra level of spending for resource efficiency was needed. LEED construction was still a new concept and some were concerned about return on investment. “Different climates present different payoffs and there were no similar type models then that we could point to,” said Shutes. Soon “environmental education, stewardship and sustainability” was codified as one of the District’s core values, opening up a new chapter in how the organization saw its responsibilities to the people it serves, Shutes explained. Five sustainability principles guide a long list of achievements in NPD’s 2016 Sustainability Report: office paper recycling; green cleaning supplies; water pervious pavement; rainwater harvesting and other water conservation measures, bee husbandry and other measures to support pollinators; restoration efforts in natural preserves; selective and minimal use of ice melt, fertilizers, and herbicides; use of alternative fuels in vehicles and equipment (Centennial Beach’s Centennial Grill provides used vegetable oil to power a park tractor); solar power on three buildings and park aerators; high-efficiency HVAC and lighting with control upgrades; and District-wide waste diversion with assistance of DuPage County’s SCARCE program. Spanish major, Kristen Rooke ('07) took lessons in sustainability learned on campus with her to her job at the Chicago Hilton. The University of Illinois' early embrace of sustainable operations served as a kind of witness to the importance they would play in the life of young College of Liberal Arts and Sciences student Kristen Rooke ('07). Public advocacy and visible action at the university affected her own values and has served her well in her professional role as assistant director of human resources at Hilton Hotel Chicago, a 2017 winner of the Illinois Sustainability Award. The company's Green Team is passionate about sustainability initiatives and they are not shy about telling you about them. Initiatives, progress, successes are all carried on the hotel's electronic communications boards, elevator information screens, internal communications, and on Hilton employee blogs worldwide, Rooke said. When the hotel opened in 1927 it was the world's largest, called "a city with a city." The Beaux-Arts style, Lake Michigan landmark boasts a Historic Hallway festooned with memorabilia including sustainability awards from Hilton, the hospitality and travel industries, and an earlier Illinois Sustainability Award received in 2013. Recent renovations offered the team broad avenues for further reducing water and energy use and new and innovative ways to reduce and repurpose waste. "While Hilton Chicago has several great achievements within the last year, the one we are most proud of is our charity donation of over 600 guestrooms worth of furniture to Catholic Charities," Rooke said. "After a comprehensive guestroom renovation, rather than selling the unneeded furniture to a liquidation company or sending it to a disposal company or landfill, Hilton Chicago chose to donate all of the furniture from over 600 guest rooms to a local organization called Catholic Charities which focuses on providing food, clothing, shelter and counseling to Chicago residents in need." The furniture went to dozens of housing sites serving veterans, formerly homeless, families, seniors, refugees, as well as adult and child day centers. The hotel's rooftop garden is managed by Windy City Harvest is a social enterprise that provides a nine-month certificate training program and internship for Chicago students in sustainable horticulture and urban agriculture. By purchasing part of that rooftop harvest, the Hilton's restaurants and banquet operations serve some of the freshest produce anywhere. By connecting the dots between actions and purpose people learn they have their own role to play in improving the sustainability of our society, Rooke explained. "We have to take care of the resources we are entrusted with such as water, utilities, etc. Sustainability is important today and will continue to be important in the future and how we manage our resources now will continue to impact how we live and do business in the future," she added. "By incorporating sustainable projects such as roof top gardens, green urban spaces or soap recycling programs, we encourage environmental responsibility." The higher education experience is more than coursework, according to Rooke. Her Spanish major from the U of I has proved a "huge asset" in one of the world's most diverse cities -- for working with guests, employees, suppliers, and the community. "My advice for up and coming Spanish majors is to not limit their career choices to the obvious 'translation' jobs," she offered. "I know I could have benefited from a double major in hospitality or business." Chris Quintero a 2016 chemical engineering graduate of UIC now works to eliminate waste and treat process water at Dynamic Manufacturing. Only weeks after his Commencement ceremony at the University of Illinois at Chicago (UIC) in December, 2016, Chris Quintero was already putting his education in chemical engineering to work at his new job at Dynamic Manufacturing, Inc. of Melrose Park and Hillside, Ill.
Quintero, a native of adjacent Northlake, IL, landed the job following an internship at Dynamic. During his first year on the job as an environmental engineer at the company he has been actively involved in Dynamic’s recycling program and wastewater pretreatment program which helped the company become a first-time winner of the Illinois Sustainability Award (ISA). Dynamic is a privately-owned supplier of OEM transmissions, torque converters, and transfer cases to the auto and related industries. Another important part of its business is remanufacturing drive train components ‘as-new,’ using a fraction of the energy and raw material. Quintero said as a student he was well aware of the benefits of sustainability to the economy because of the efforts of UIC, which itself has been awarded the ISA four times. “Seeing the work being done at UIC in regard to sustainability, and the fact that they have won the Governor’s Sustainability Award in the past, has reinforced my positive attitude towards sustainability,” he said. Now he trains hundreds of Dynamic employees on environmental topics as part of the Environmental Health and Safety staff. He is a key player in the firm’s Plant Recycling Program, overseeing recycling in two of the company’s seven facilities. “Since joining Dynamic, I obtained my Industrial Wastewater Treatment License and oversee the operation of our Wastewater Pretreatment System,” Quintero said. “I am always looking for ways to improve the efficiency and performance of our wastewater treatment process.” He is also actively involved in the company’s Earth Day celebration. The wastewater pretreatment system kept 192,000 gallons from needing to be shipped offsite for treatment. Other sustainability improvements that contributed to Dynamic’s successful application included capture of transmission fluid and solvents for recycling, reduction in hazardous waste and significant quantifiable improvements in worker health and safety. Graduate studies at the University of Illinois Springfield put Nick Moshage ('16) put him at the heart of clean energy policy in Illinois, serving an Graduate Public Service Internship. He helped provide rebates for solar and wind projects statewide while working at the Department of Commerce and Economic Opportunity's Solar and Wind Renewable Energy program. Nick Moshage increased his impact on green energy from one state to 12. That experience and his work in the UIS Masters of Public Administration program proved strong preparation for his current job, Senior Program Associate at the Midwest Energy Efficiency Alliance (MEEA) headquartered in Chicago, which is a 2017 winner of the Illinois Sustainability Award. "There I learned a great deal about energy efficiency and its role in sustainability," Moshage said. "The internship really helped to shape and inform my opinions about sustainability. None of it would have been possible without the tremendous opportunities available through the U of I." 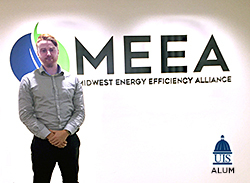 MEEA provides a larger stage for his work, serving 12 Midwestern states with support for energy efficiency through policy advocacy (such as Illinois' Future Energy Jobs Act), contractor training, fostering market penetration of existing technologies and promotes new technologies, products and best practices. Moshage's Savings Through Efficient Products (STEP) program has made significant inroads in improving the energy performance of Illinois' public buildings. During the past year alone STEP has helped public facilities in Illinois to cut electricity use by 2,763,235 kWh and natural gas use by 113,563 therms. He is responsible for all STEP marketing and outreach efforts and acts as the main point of contact for the program. "I am tasked with guiding customers through the entire program process (from onboarding to product installation verification) and I also serve as the liaison between our engineer staff and clients." "In the broadest sense, the importance of sustainable living can be quantified by the health of Earth’s ecosystems," he said. "The greater our efforts now, the more we will have to offer future generations to enjoy and improve upon." Perhaps few U of I graduates rise and shine each day with so clear a view of their ultimate reasons to go to work. "I became interested in sustainability and energy efficiency during my time in graduate school and where it helped to formulate my career goals," Moshage explained. "I personally define sustainability as making an effort to reduce the environmental impacts of any action you are undertaking. It can be something as small as choosing to recycle your lunch waste or as large as endeavoring to make your home LEED certified (on his wish list). Whatever the action, it means taking the time to think about the possible negative side-effects and work to mitigate them." The 2017 Illinois Sustainability Awards were presented October 24 at the Union League Club in Chicago. Illinois companies, communities, and organizations have been vying for the ISA, one of the earliest programs recognizing sustainability achievements, for 31 years.